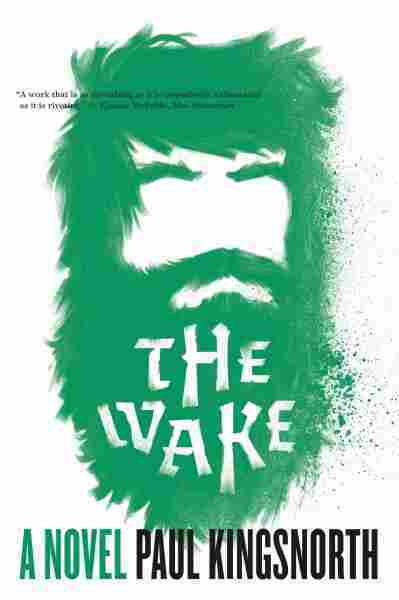 'The Wake' Is An Unlikely Hit In An Imaginary Language Paul Kingsnorth self-published The Wake, his tale of the 11th-century Norman conquest of England, written in a pastiche of Old and modern English — and was startled when it became a smash hit. 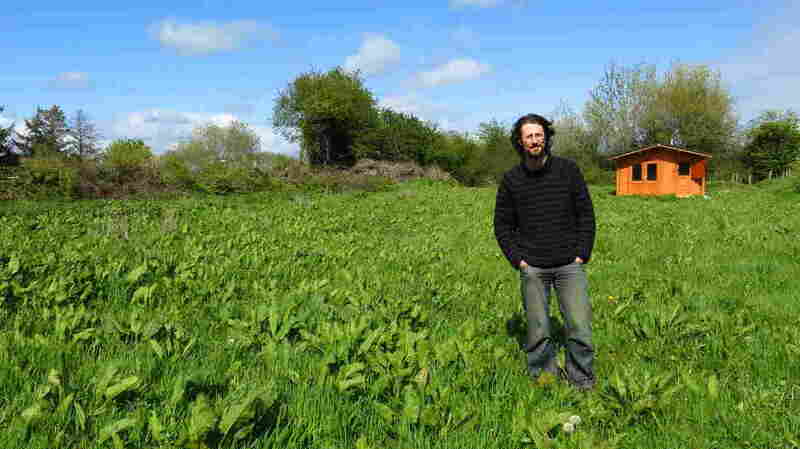 Paul Kingsnorth — seen here in front of his writing shed — used a crowdfunding platform to publish The Wake after mainstream houses didn't bite. Paul Kingsnorth's new novel, The Wake — a grim tale of medieval conquest and revenge — became a hit against all odds in the U.K. last year, and it's about to be released in the U.S. I met Kingsnorth at his home in the countryside of far western Ireland. He and his wife grow their own food and home-school their two young kids. "I think we'll get bees and chickens, we hope, maybe something else," he told me, calling out to his daughter. "Lela, you want an alpaca, don't you? Lela wants an alpaca or a donkey or anything fluffy, really." Kingsnorth's novel is definitely not soft and fluffy. The Wake is set during the Norman conquest, when armies from France swept across England, crushing Anglo-Saxon civilization. It's sort of a post-apocalyptic tale, set in the 11th century. And it's also written in a slightly made-up language (more about that in a bit). Before the book came out in Britain last year, Kingsnorth assumed it would be a flop. "I suppose I was probably halfway through it when I thought: There's no way anybody's going to publish this," he said. "I'm writing a book about a period in history no one knows about, in a language no one can understand, with a central character who's horrible. There's absolutely no way anyone's going to touch this with a bargepole, but I don't care!" Kingsnorth used a crowdfunding platform called Unbound to fund the book because he couldn't get any mainstream publishers to bite. Then something strange happened: "The first inkling I got that it might be successful was when the first review came out, which was in The Guardian, which said it was a literary triumph. Which, I thought, 'Blimey, no one's ever said that about my writing before!' "
Then one day he was working in the garden when he got a phone call with some news: "It's just been long-listed for the Booker Prize. And I thought, bloody hell, what? This is ridiculous!" If that doesn't sound like modern English, well, it's not. The Wake is not written in modern English. At first, Kingsnorth tried writing the book in the language you and I speak today. "I didn't get too far, and I just thought this isn't working," he said. "It seemed strange. It made me realize why some historical novels I've read didn't work for me. I thought, I just can't have this guy doing 300 pages of contemporary English idiom, and what's the alternative to that?" I thought, I just can't have this guy doing 300 pages of contemporary English idiom, and what's the alternative to that? So he began by sprinkling a few Old English words into the text. Then, he went all the way until it was nearly incomprehensible. Finally, he pulled back on the throttle to create what he calls a "shadow tongue," a mashup of old and new. The main character is a rebel — an insurgent who tries to fight back against the invading French. As a reader, I found that the language starts as an obstacle but quickly pulls you deep into the world of the novel. Kingsnorth said this is because the words we use to describe our world shape our perception of it. "So, there might be 10 different names in 10 different languages for that willow tree over there. And they may give the people who use those names a subtly different way of understanding the tree, a subtly different relationship to it," he said. I asked Kingsnorth whether he began to see the land around him differently because of the language he was using to describe it. "Yes, I think I probably did," he told me. "I think what you find when you start to look at Old English and you start to look at the kind of Anglo-Saxon relationship with the land is that it's a starker thing. Because it's possible to just pass over landscapes in the world today, you don't have to really have any relationship with the land at all; you can drive through them. And if you're living the kind of life that these people lived in the Fens 1,000 years ago, you have to have a relationship with every single thing that's there." I don't doubt that 1,000 years ago there were men in England saying, oh, it was better when our fathers came, it was better when their fathers came. Of course there would've been. The Anglo-Saxon relationship to the swampy land known as the Fens is similar to Kingsnorth's relationship with his land in western Ireland. The house is disconnected from the water grid; he and his wife plan to put up solar panels and wind turbines to get off the electrical grid, too. There are clear parallels between Kingsnorth's writing and his lifestyle: the closeness to the land; the sense that civilization as we know it may not last; the longing for a simpler time, a longing that permeates The Wake, even though it's set 1,000 years in the past. "This is one of the other things I was exploring in the book, actually, is the idea of nostalgia, that there's always a time before your time when things were better," Kingsnorth said. "Because I can be prone to that myself, so I wanted to explore what that was like. And I don't doubt that 1,000 years ago there were men in England saying, oh, it was better when our fathers came, it was better when their fathers came. Of course there would've been. And maybe it would've been. But there's always a temptation to see this time before a fall when everything came apart." Those echoes between the 11th century and the present day resonated with English readers; the U.K. booksellers' industry crowned The Wake "Book of the Year." The novel will be released in the U.S. next week.